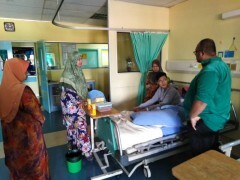 A welfare visit to Hospital Pakar Sultanah Fatimah was organised to see Centre for Foundation Studies (CFS) student, Br. Muhammad Azrin bin Salleh who was admitted to the hospital due to kidney related disease which caused inflammation and poor functioning of the kidney. The student condition has since improved after undergoing dialysis for several times. The visit was joined by the Mahallah al- Biruni Principal, Fellow and Residential, Discipline and Welfare Unit of Office of Deputy Dean Student Affairs, CFS. Let us pray to Allah, The Sustainer of Mankind, may He remove the illness, cure the disease so that Br. Muhammad Azrin recuperates sooner and thus be able to continue his study.